A panel of Mexican scholars warned that the administration of President Andrés Manuel López Obrador would face immediate challenges on immigration, U.S.-Mexican relations and crime and corruption. UCLA International Institute, December 19, 2018 — “There has been a huge mobilization [of] Central Americans and also within Mexico to address and pay more attention to the realities of migrants crossing through the country and the abuses of human rights that they are facing, the lack of response from the Mexican government and, in some cases, the involvement of Mexican authorities in creating some of these mechanisms of abuse,” said Alexandra Délano Alonso, associate professor and chair of global studies at The New School, at a special event on the Mexican elections of 2018 held at UCLA in mid-November. 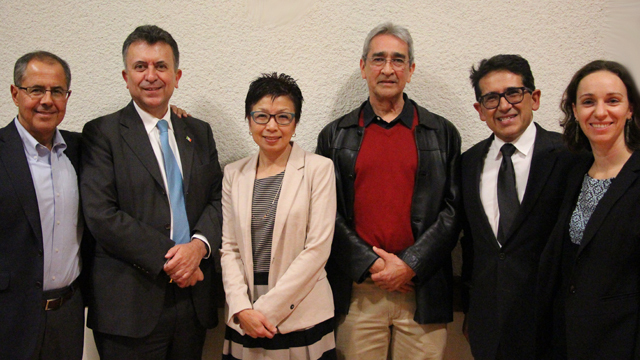 Sponsored by the Center for Mexican Studies and the Consulate General of Mexico in Los Angeles, the event featured an academic panel that discussed the obstacles and proposals of the incoming Mexican administration with regard to security, immigration and bilateral relations with the United States. 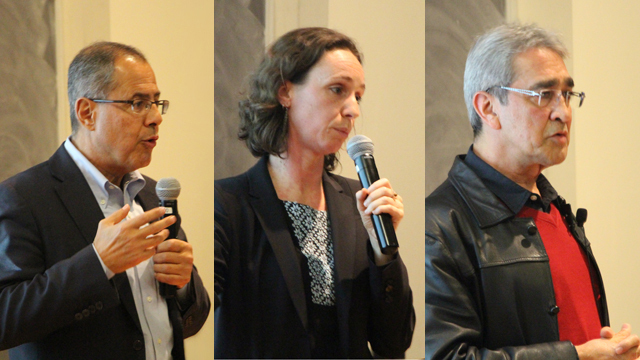 Additional speakers included sociologist Luis Astorga, researcher, Universidad Nacional Autónoma de México, and Rafael Fernández de Castro, professor and director, Center for U.S-Mexican Studies, UC San Diego, and former foreign policy advisor to Mexican President Felipe Calderón (2008–11). The panel was moderated by Rubén Hernández-Leon, director, Center for Mexican Studies, and professor of sociology at UCLA. Presidential candidate Andrés Manuel López Obrador won the July 1, 2018, presidential race in Mexico after obtaining close to 60 percent of the votes, and took office on December 1. López Obrador has been labeled one of the most progressive candidates to ever take office in the country. During his entire political career, he has been a strong critic of corruption and an advocate for student education and better protection of the rights of indigenous peoples and low-income Mexicans. For decades, explained Alexandra Délano Alonso, thousands of refugees from Central America and other parts of the world have used Mexico as a transit country to reach the United States. In their journey through Mexico, they become targets of Mexican cartels, human traffickers and corrupt Mexican authorities. The so-called Central American “caravan” that arrived in Mexico in November 2018 is composed of thousands of refugees fleeing violence and poverty in Central American countries. Former President Enrique Peña Nieto, like previous Mexican presidents, failed to create a solution to guarantee the rights of undocumented refugees in Mexico. During his presidential campaign, López Obrador criticized the poor treatment of migrants in the country and, prior to his inauguration, proposed to give work visas to migrants, as well as to provide funds to increase jobs for migrants and low-income individuals in Mexico. The incoming administration, she argued, should concentrate on creating policies and long-term relief programs that focus on the protection of foreign refugees and returning Mexican deportees. “One of the things that is clearly lacking in [López Obrador’s] position,” she said, “…is a very long-term perspective. The incoming government has not been able to articulate a clear response to the short term [challenge]: what to do with the reality of the migrants and caravan entering the country at this particular moment,” the scholar added. Délano Alonso criticized the lack of policies and programs to protect refugees in Mexico and returning U.S deportees. “There was a huge protest in Tijuana against the caravan, arguing that they are criminals and they are taking our jobs and they are a security threat. There is a huge stigma and criminalization of migrants,” she said. “Migrants not just coming from Central America, but also Mexican migrants returning to Mexico, are seen as no longer belonging. The culture in relation to migration issues in México is something that needs to shift and hasn't been able to,” she remarked. Rafael Fernández de Castro criticized Trump’s approach of dealing with the Mexico-U.S relationship, emphasizing the stable collaboration between the two countries during the presidential terms of the four U.S presidents who preceded Trump in office. In recent years, bilateral relations have deteriorated due to efforts to criminalize undocumented Mexican immigrants living in the United States, pressure on Mexico to pay for a border wall and threats to terminate the NAFTA treaty, noted Fernández de Castro. The incoming administration of López Obrador hopes to improve U.S.-Mexico relations without becoming a target of U.S pressure. His administration is likely to reject U.S intervention and its politics of criminalizing Mexican migrants abroad, he remarked. During his campaign, López Obrador said he would prioritize reducing corruption, violence and poverty during his six-year presidential term. “He is going to fight four wars and we are going to judge his presidency based on the results of these four wars: corruption, violence, poverty and U.S Mexico relations,” explained Fernández de Castro. Luis Astorga criticized previous attempts to militarize the country to reduce the level organized crime. In the 1970s, for example, he said that Operación Cóndor of the Mexican military violated the rights of thousands of poor farmers, who were often falsely accused of participating in organized crime. As a result, many Mexican citizens were tortured and incarcerated without evidence or a right to a fair trial. Because of this history, Mexican academics have strongly criticized López Obrador for his intention to create a National Guard for the purpose of reducing organized crime. “Deploying the military in the streets of Mexico again could undermine human rights,” said Astorga. “The Cóndor operation was a deployment of… approximately 10,000 soldiers with the objective of destroying illicit crops and prosecuting the leaders of criminal organizations,” he said. The human rights consequences of this military action were severe, he cautioned. Poverty and violence produced from organized crimes seem to influence one another. While this may be true, Astorga argued, “Poverty and inequality influence the level of violence, but there are countries in the world much poorer and much more unequal than Mexico such as Nigeria, and yet they have lower homicides rates…. Violence, rather, is caused by the type of state, the type of institutions and the mechanisms of institutional control,” he added. All three scholars agreed that to move forward, the new Mexican president must learn from history and avoid the mistakes of previous administrations. Because of the negative results of previous militarized policies, they suggested shifting from using military force to allocating resources to local authorities. The panelists also criticized López Obrador for breaking his promise to reduce the military’s power. “In the 2012 presidential campaign, López Obrador said that if elected, in six months he would withdraw the military from their current tasks:” said Astorga. “But after being elected, he propose[d ] creat[ing] a national guard.” Although the incoming president has the right intentions, the scholars concurred that his administration will need to immediately create effective short-term plans to address both migration and criminality.